Order Tropical Wholefoods Organic Dried Mango from the Online Health Food Store UK. 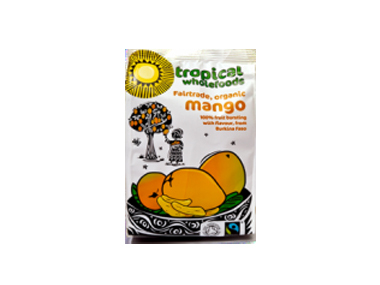 Buy Tropical Wholefoods Fairtrade, Organic Dried Mango - 100g and other quality Dried Fruits safely online in the UK. Fairtrade organic dried mango is the perfect addition to healthy lunchboxes and great food for walking or taking camping. Fairtrade organic dried mango is the perfect addition to healthy lunchboxes and great food for walking or taking camping. Once opened, store the mango in an airtight container and it will last for ages. The dried mangoes are 100% free from preservatives or added sugars. 30g of our mango slices make up one of your 5 a day portions of fruit. Dried mango is also a source of dietary fibre. Our UK Health Shop sells real Tropical Wholefoods and other Dried Fruits from top-quality brands safely online to customers throughout the United Kingdom in England, Wales, Scotland and Northern-Ireland. View more products on the Online Health Food Store from Tropical Wholefoods. Where to buy Tropical Wholefoods Organic Dried Mango safely online? Shop at the Online Health Food Store if you are wondering where you can buy Tropical Wholefoods Fairtrade, Organic Dried Mango - 100g safely online in the United Kingdom. Our Health Shop is located in the UK and our award-winning independent has been serving customers in England, Wales, Scotland and Northern-Ireland since 1976. You can buy our Dried Fruits online and we post out orders to any UK address. Organic Dried Mango - Tropical Wholefoods Fairtrade, Organic Dried Mango - 100g in Dried Fruits and Foods.